You are currently browsing the monthly archive for May 2015. 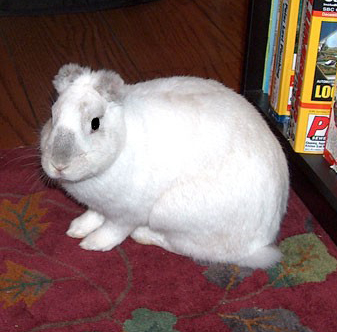 As regular readers know, this blog is about animal activism, but I want to use this space to celebrate the life an extraordinary rabbit who died this week. Although he was not among the rabbits I’ve personally adopted over the years, I visited him frequently, and he made a big impression on me. He lives on as a reminder of why why we advocate for all animals. He was known around SaveABunny as “the miracle bunny.” He had arrived at the sanctuary in the fall of 2005 with severe burns, having been doused with lighter fluid and set alight by a teenager in nearby Vallejo, California. He suffered second- and third-degree burns over much of his body, including his head. His skin also had cigarette burns. I can only imagine the torture he’d endured. But he had a strong will to live, and having survived the flames, Marcy Schaaf, SaveABunny’s founder, named him “Phoenix.” They quickly bonded, and eventually it became clear that SaveABunny would be his forever home. It is all but impossible for a bunny hugger not to love all rabbits, but Phoenix was extra special. When I learned on April 28 that he had died sometime during the night, I found comfort in remembering how much affection and attention he received from those who appreciated him for who he was. Not that loving Phoenix was a chore—far from it. He was resilient and mischievous and spirited. He enjoyed playing, being talked to, and napping in the sunshine. And, like all rabbits, he loved a good binky and a bit of banana or carrot. SaveABunny took him in right about the time I had decided I wanted to foster rabbits. “Foster,” indeed. I think I managed to actually foster only one. I became instantly attached to the others, six in all, and had to quickly learn how to be a good bunny guardian. Thus I found myself at the sanctuary fairly often, and it was inspiring seeing how Phoenix healed and how committed everyone was to giving him the best care possible. As the remains of his charred outer ears fell off and his medical needs became more acute, SaveABunny established The Phoenix Fund to help him and the most seriously ill and injured bunnies get the treatment they need. Though deeply wounded—physically and psychologically—Phoenix learned to trust humans. I was always astonished that he would let me, or anyone, pet him. But he did, and he seemed to know he was never going to be harmed again. It was especially gratifying to see Phoenix bond with other rabbits, since early on he seemed to have little interest in his peers. He found love with Melody, and when she died, it was heartbreaking. But he loved again, this time with a gentle, bashful bunny named Poodalia. You can see a short video of them together here. If you know rabbits, you know part of their bonding ritual is to groom each other’s ears. Poodalia didn’t care that Phoenix had no outer ears—she just licked the base where his ears had been, and Phoenix patiently complied (even if it made him twitch his head). Sadly, after a long life, Poodalia passed in March. I last visited Phoenix a couple of months ago, delighted for the chance to say hello and pet him and marvel at his ability to forgive human beings. Since that time, he had joined a group of other senior, special-needs rabbits at SaveABunny—several friends affectionately known as the Late Bloomer Club. In the decade Phoenix lived at SaveABunny, he healed others as he himself healed. He learned to trust and help teach people about animal abuse. He loved and was loved. As his health declined and the end came closer, I understand Marcy was ready to make the agonizing decision to help end his suffering. In what seems to me like his final gift to her, Phoenix let go and died among his fellow Later Bloomers, surrounded by unconditional love. He really was a miracle bunny. Postscript: Because he was a minor, Phoenix’s tormentor was never publicly unmasked. Animal cruelty charges were filed against him, but in the end, he received probation and counseling.